Do you want to eat healthier this year? 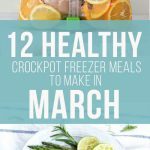 Crockpot freezer meals are your answer. 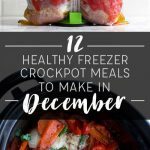 After making thousands of crockpot freezer meals myself, I’m convinced there’s no easier way to make healthy, delicious, and budget-friendly meals. Here are 12 of my favorite recipes to help you get started (full grocery list below!). They can be frozen without any cooking ahead of time and then dumped into a crockpot in the morning. All of the ingredients cook down together so they smell and taste amazing. You can save a lot of money by buying the ingredients in bulk. 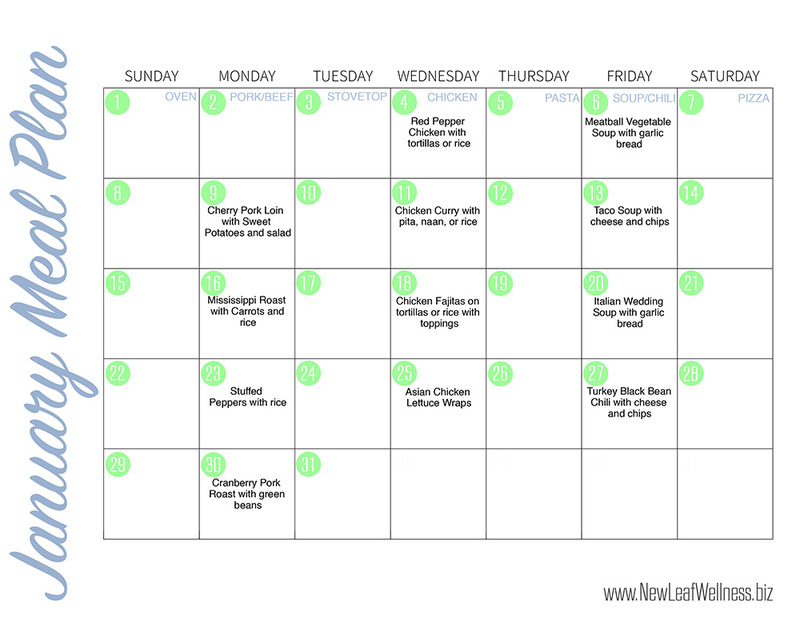 I spaced out the recipes to include a variety of proteins, tastes, and textures each week. Thank you so much for all of your recipes and shopping lists!! We are going through a major kitchen remodel soon and I was looking for freezer meals for the crock pot that will help get us through the next few weeks without going out to eat all the time. I love that you make such a huge effort to include lots of veggies. This was exactly what I was looking for! Thanks again! Vicki, you’re so welcome. Good luck with the kitchen remodel!! Hi Kelly! Thanks so much for doing this and making my weekdays easier! I’ve been following your meal plans the past few months and it’s made such a difference at our home. I’m way less stressed about getting dinner on the table in between everyone’s sports, tutoring, and other activities. I was having trouble however getting this month’s meal calendar to be editable; I’m unable to move meals or type in my own like I have in the past. It seems the individual dates are not text editable boxes? Anyway, I’ll print it and edit it on paper lol. Sorry about that! I fixed it. Are your recipes meant to be cooked in the crockpot on high or on low? Thank you! Michele, you can cook them on low. My husband recently had triple bypass surgery, and we’re really watching the sodium content on what we eat. Do you have the nutrition information available for these recipes? I know I’ve seen that when I’ve bought the e-cookbooks, but not on the site or emails. Jean, unfortunately we don’t have the resources to provide nutritional information for all of our posts, but you are correct it is including in our ebooks. AND we have a new one coming out on Thursday…Clean Eating! In fact, my Dad had a triple bypass last year and he has eaten many of the recipes included in the new book. I’m interested in trying your recipes. What size crock pot do you use? Hi I’m so excited to try these recipes! I was wanting to make the cherry pork tender loin but saw that it said to add all of the ingredients to the bag except for the broth and then when you cook it to add the broth. What broth should I use for this? I didn’t see it listed on the ingredients. No broth needed. That’s a typo in the directions. I probably copy and pasted it from the directions of another recipe. Sorry! !